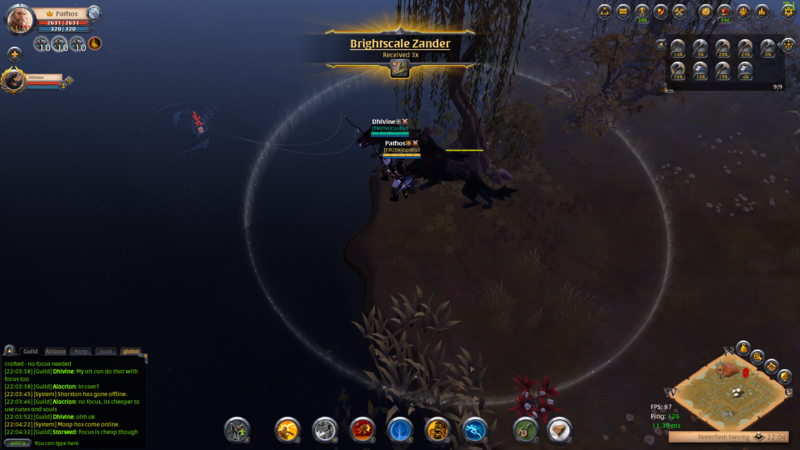 Pathos covers everything you need to know about fishing in Albion, from the basics to advanced strategy. Fishing is a unique way of gathering in Albion Online. No other type of gathering compares to it, and the minigame keeps it exciting and fun. Every guild needs a fisherman to gather seaweed, chopped fish, and rare fish to make the enchanted food needed for GVGs, though you can catch fish up to and including T8 without having to gather in a guild territory. 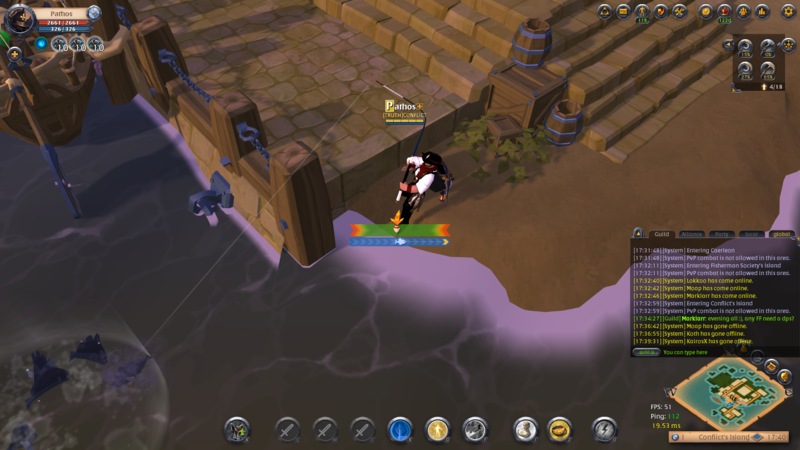 If you have a usable fishing rod in your inventory, the mouse will appear as a fishing bob when you hover over water. Select a location on the water, hold the left button to build up your cast distance, and release at the desired point. If you cast successfully, the bob will float on the water. As soon as it starts to bounce, you've hooked a fish. Click the left mouse button to start reeling it in. This will prompt the minigame. The minigame is a game of balance, where you need to keep the fishing bob inside the green UI field. If the fishing bob moves too far to the left or right (into the red areas) the fishing attempt will fail. Holding the left mouse button will cause the fishing bob will move to the right, and the fish icon on the blue bar will move forward. Releasing the left mouse button will prompt the fishing bob to automatically move to the left. Once the white fish icon arrives at the yellow end of the blue bar ( >> ), the fish or other loot will be caught and added to your inventory. Fish can be caught all over Albion, but there are two different types of water in the world: freshwater and saltwater. All rivers, lakes, ponds and other similar bodies of water that can be found inland are considered freshwater. Saltwater can only be found in zones that border the ocean. Schools of fish give a quicker bite and spawn in all kinds of waters. Occasionally, and very rarely, treasures can be found as well in the waters of Albion. These may include things like include luxury goods, weapons and armor, or a Tome of Insight. The tier level of sunken treasures increases as you fish in higher-tier zones. Players have to use a fishing rod to catch fish, and you can only catch fish of a tier up to or equal to the level of your fishing rod. However, players can also equip fishing gear to increase their fishing yield. 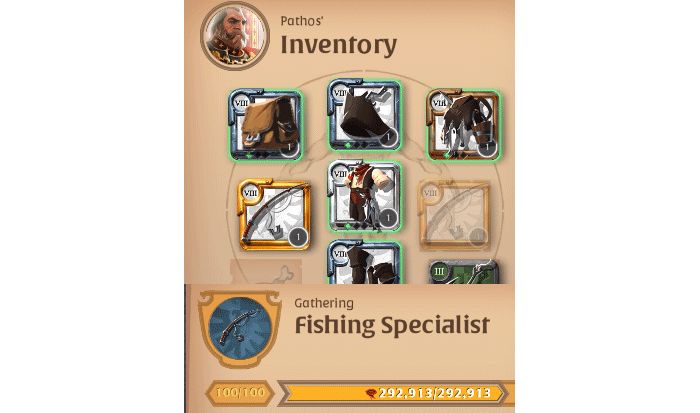 Fishing gear has special passive skills that increase the fishing yield the longer a player equips the gear. Higher item quality fishing rods provide a higher bonus to fishing speed. It's always a good idea when out fishing to wear a fisherman backpack because of the weight reduction they provide, allowing you to gather as many fish as possible without overloading yourself. You can do 2 things to level fishing up: catch fish or eat fish. I personally think the quickest way to level is by catching fish in swamps and forest zones because off the high amount of pools these zones have. Players can use bait to increase the bite speed of fish. Bait can be crafted from earthworms at any cooking station, and earthworms are found when harvesting crops during farming.